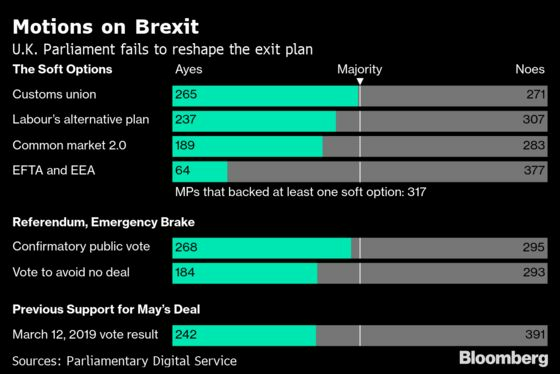 (Bloomberg) -- British members of Parliament will once again take control of the Brexit process on Monday, voting on alternatives to Prime Minister Theresa May’s thrice-defeated deal. House of Commons Speaker John Bercow selected four options, all of which would either keep closer ties to the European Union than the premier’s plan entails, or potentially stop Brexit altogether. An initial round of voting last week failed to produce a majority for any outcome. Here’s a summary of them in the order listed by Parliament, including their identifiers in brackets. Voting begins at about 8 p.m. and the results are expected around 10 p.m. While the result won’t be binding on the government, lawmakers could try to make it so when the process continues on Wednesday. Conservative grandee Kenneth Clarke wants the U.K. to leave the EU having secured a permanent customs union with the bloc at a minimum, and for this to be enshrined in primary legislation. This option was the most popular last week, just six short of a majority. 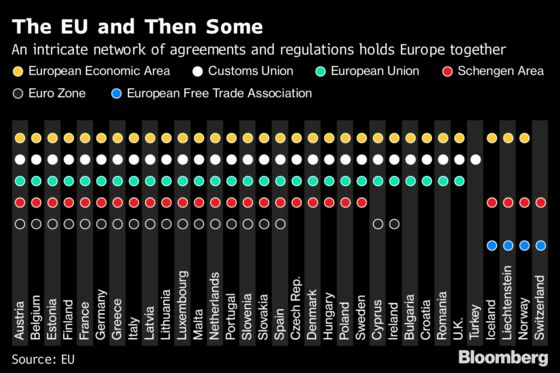 The U.K. stays in the European Economic Area and rejoins the European Free Trade Association, giving it access to the EU single market. That’s Norway’s relationship. But this adds a “comprehensive customs arrangement” to it -- hence the “Norway Plus” moniker. It’s backed by Labour’s Stephen Kinnock and Lucy Powell, and Tories Nick Boles and Robert Halfon. This plan has been gaining momentum, with both Labour and the Scottish National Party saying they’ll support it. A process motion that says Parliament shouldn’t ratify or implement any withdrawal agreement until it has been approved in a referendum. It’s in the name of Labour’s Peter Kyle and Phil Wilson, as well as Margaret Beckett. Another popular option last week, with 268 votes in favor. A process amendment, this would require a confirmatory vote in Parliament if the U.K. got to within two days of a no-deal Brexit. Proposed by the Scottish National Party’s Joanna Cherry, it’s also backed by Grieve and Liberal Democratic Party leader Vince Cable.